TERMIGNONI can improve your performance through using their UpMap system. UpMap gives you the access to an universe of mapping developed and tested by our experts, through the synergy between the UpMap application and the T800 device , you will be able to shape your bike. 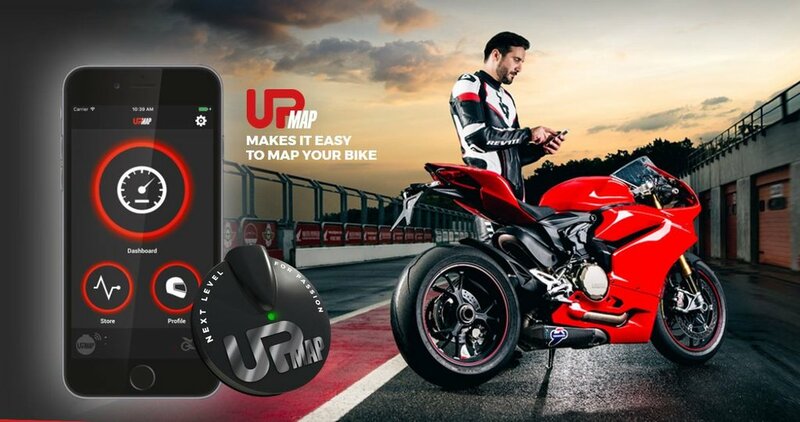 UpMap is the first system which allows you to communicate with the ECU of your bike connecting the T800 device with UpMap app (available for IOS and Android). Download from the UpMap store one of the map developed and tested by Termignoni and have free access to the setting of your ECU for an easy and intuitive customization. UpMap is not just for mapping, it is a system dedicated to the biker. You will find a dashboard, an on-board computer which displays the status of your bike, monitoring speed, gear and consumption. In addtion, the new Camera option will allow you to record amazing videos of your performance, enriched by graphics and information of your achievements.